Planting lavender is a nice way to start an herb garden. Lavender is one of those magical herbs that seem to invoke images of a more gracious time. Think of ladies walking through cottage gardens with baskets of herbs and flowers, or garden parties on miles of groomed lawn where water sparkles in nearby fountains and stone birdbaths. In these idylls, lavender is everywhere, and attended to diligently by busy bees that never sting. Growing lavender in your garden can be another matter, especially if you don't have a full time gardener, and the part time gardener in your universe is you. If you want to grow lavender, keep these things in mind, especially if you haven't had much success in the past. Prefer young plants to planting seeds - Lavender seed is slow to germinate (think 2 to 4 weeks, if then), and the sprouts are small and delicate (needy). You'll have much better success choosing a variety you like (there are lots to choose from, but that's a different post), and taking cuttings to create clones. You can do this pretty easily, especially with an inexpensive cloner, and the process is less frustrating than dealing with lavender seed. Sun and soil - This plant likes full sun and moderately rich soil. It can stand drought conditions, but only after it's established. For the first year, baby young lavender plants by making sure they don't dry out, and if high summer brings punishing heat, provide a little shade. Dig a big hole - Lavender can send out an impressive network of roots, so give it a large, deep hole. I'm not going to get too specific, but whatever hole you think is large enough, make it half again larger and deeper. Pay attention to soil depth and consistency - Once you have a few plants, prep your soil carefully. Lavender needs good drainage. Let me say it again for emphasis: Lavender needs GOOD DRAINAGE. Sorry for the yelling, but nothing kills a nice lavender plant faster than wet roots. You can increase your chances of succeeding with this herb by making sure you give it the right soil. I've written "provide soil that drains well" at least a hundred times on plant posts and in articles, but this time take it as gospel. Most gardens have clay soil, which can be a death sentence for lavender. Add sand, perlite, vermiculite, pot shards, pea gravel or pebbles, but make sure lavender's roots don't stay wet after watering or a good rain. Another option would be to plant on a hill or gentle slope that has good drainage naturally. You will still have to add loosening agents to the soil, but some of the work will be done for you and will act as added insurance. If you can't easily crumble and flip the soil in the planting hole you're using for lavender, it isn't porous enough. Wait for warmer weather - Lavender really takes off when the soil warms up in spring. If you're trying seeds or have seedlings from your grower ready to go, keeping them on a heated plant mat will make them happier, as will transplanting them about a week after you install your tomato plants, which should be after the frost free date for your area. Air flow can be important, too - Placing plants where there's a breeze but no major buffeting will help insure good air circulation and less chance of mildew growth. You can help this along by keeping plants pruned with a somewhat open shape. Since every part of the plant smells wonderful, pruning shouldn't be a problem. If all else fails, add snipped stems to potpourri. Give lavender room - Most lavender varieties can grow to a height of between 14 to 32 inches and reach 14 to 32 inches across. Check the listing on the plants you purchase for a better idea of how large they'll grow. Crowded plants become stressed and are more susceptible to mildew, insect predation and all manner of diseases. Thin seedlings to allow plenty of space between plants: This is important because it encourages good air flow, too. Humidity can be the enemy - Lavender plants need water, sure, but excess moisture and sometimes even high humidity can be a problem. If you live in a humid location, there are lavender cultivars that are more tolerant of muggy summer days, and your best option is to stick with them. Phenomenal (Lavandula x intermedia, Phenomenal) is one of the more popular, but every year sees new hybrids designed for heat, cold, moisture and pest resistance, so check your seed and plant catalogs for what available this season. Water wisely - It also helps to water plants in the morning, not in the evening or during the hottest part of the day. Once established, lavender is pretty hardy, so it won't be a prima donna in the years to come. For the first year or so, though, give it special attention. You'll read that lavender is a pretty indestructible, and that can be true if the above conditions are met. With this classic herb, good prep is the secret to great plants. 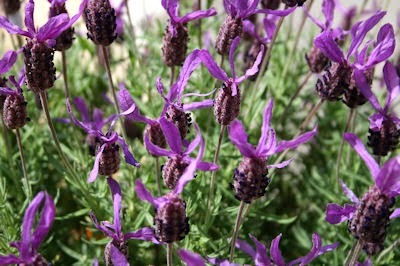 Planting lavender and cultivating a nice bed of purple blooms can be fun and rewarding. Give it a try.